Make your installation a success with some Empire know-how. 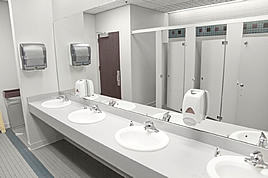 You've decided on one of our new hands-free towel, tissue or soap dispensing systems for your new or remodeled restroom facility. But now that you have it, how will you install it? Give us a call. We'll coordinate this type of installation, as well as our new money-saving chemical dilution systems or new auto-faucet/flush units. We'll even train your employees on the proper usage and safe handling of the products used in these systems. Our professional service teams will ensure that your dispensers are installed to satisfy all ADA requirements. Let us do a facility walk-through survey. We'll make suggestions and give advice on other safety and money-saving ideas. Make your installation a success with some Empire know-how.